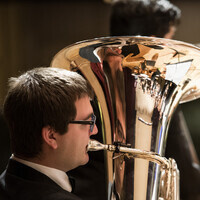 During the evening, Pacific Concert Band directed by Eric Hammer will perform Dedicatory Overture by Clifton Williams; Amazing Grace by Frank Ticheli; and Second Suite in F by Gustav Holst. We are also excited to welcome guest artists from the East Union High School directed by Terry Silveira. The students will perform Burn by Roland Barrett; Overture for Winds by Charles Carter; The Mask of Zorro by James Horner and arranged by John Moss; and Under the Double Eagle by J.F. Wagner.